Introduced in the early 1960s to the industrial and institutional market, water-soluble technology was relaunched into consumer sales success with the 2012 debut of Proctor & Gamble’s Tide® PODS. The unit dose of liquid detergent enclosed in a dissolvable plastic disc revolutionized the detergent market. Today, water-soluble packaging is used for a host of household and commercial cleaning products, and is well on its way to delivering single servings of everything from shaving cream and shampoo to food products in edible film. Innovations in contract packaging have often been the result of consumer demands for convenience and safer products, a shift in environmental trends or changes in FDA or EPA regulations. Not only do water-soluble pods address most, or all, of these concerns, they offer a uniqueness in the marketplace and can help brands gain a competitive edge. Brands are continuing to benefit from Polyvinyl Alcohol (PVA or PVOH) technology, the film packaging that has simplified unit dosing of products for ease of use. Because so many products traditionally packaged in bottled and boxed liquid and powder formats can transition to water-soluble pods, new brands—and product formulations—continue to enter this space. than two billion water-soluble pods in 2016. The Mount Prospect facility utilizes 10 production lines to adapt to the changing laundry and dish markets, as well as the industrial and institutional cleaning space, oil/gas and agriculture industries. Production equipment includes rotary drum machines, vertical and horizontal FFS machines, blenders, and multi-chamber machines producing both liquid and powder products. With industry-leading expertise in water-soluble technology, Multi-Pack Solutions now is working with major brands to produce shampoo, body wash and shaving cream in single-use water-soluble pods for general consumer consumption and for patient use in hospitals. Whether your product is a liquid or powder, it must be compatible with the Polyvinyl Alcohol (PVA) film used for unit-dose packaging. Those new to the water-soluble packaging industry often misunderstand that bottled laundry detergent, for example, cannot simply be poured into the film to make a water-soluble pod. Liquid laundry detergent is high in water content; therefore, it would quickly dissolve the film. Testing a formula for water content is a critical first step since approximately 90 percent of liquid laundry detergents contain too much water for water-soluble pod packaging. Brands new to the water-soluble pod space also should be aware of existing patents that protect the “sweet spot” or ideal water content for water-soluble pods, which is around seven percent. New brands have successfully formulated around the patented parameters, such as adding an agent that allows water to chemically bond with something other than the water-soluble film. Powders also must be compatible with the Polyvinyl Alcohol (PVA) film used for unit-dose packaging. For example, pool shock put directly into the PVA film will cause discoloration and turn the film insoluble after several days due to chemicals in the product formula that are not compatible with the film. To ensure the packaging stability of your unit dose water-soluble product, a film compatibility test performed by the film manufacturer is critical. Extensive testing may be required to achieve a workable formula. 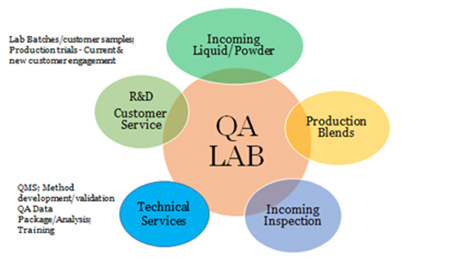 For powders, both density and flowability are important. 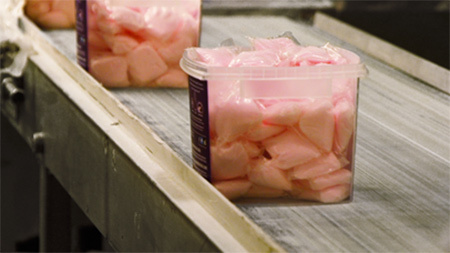 Pods can be filled with low and high density powders, but the density must remain consistent throughout the filling process. A powder that does not exhibit consistent density throughout will not distribute properly within the drum-filling system, which can prevent achieving proper fill weights. As a full-service contract packager, Multi-Pack Solutions offers powder blending capabilities at its Mount Prospect facility. Additionally, Multi-Pack Solutions collaborates with customers on formulation, production process and method development, and quality data. Our technical services include sample testing and analysis of lab batch blend samples, and trials support for blending and production runs. Are you looking for a square, rectangular or circular pouch? Does your formula require one compartment, two or more? Do you want your pod to dissolve immediately or more slowly? The shape of your water-soluble pod is not just about aesthetics or brand distinction. For example, the shape of an automatic dishwashing pod is dependent on the size of the dishwasher’s detergent cup. In this instance, smaller square or rectangular pods are the best shape considerations for fitting snuggly into most dishwasher units. Dual-layer and multi-chamber pods are a consideration for delivering incompatible formulas such as a detergent and a scent booster in a single-unit dose. Multiple liquids and powders can be stored in different sections of a water-soluble pod so that they don’t touch each other until the pod is placed into the washing machine. Multi-chamber pods allow for brand creativity within certain guidelines. For example, triangle chambers can be created within a rectangular pod, but edges must be rounded to prevent the sharper edges of a triangle shape from popping the film. Film thickness is another consideration. Multi-Pack Solutions manufactures and packages pods for a variety of applications using film from 1.5 Mil up to 4 Mil. A pod made from 1.5 Mil film will dissolve quickly and one made from a thicker film more slowly. While most brands want dissolution as quickly as possible, one Multi-Pack Solutions customer with a concept for a septic tank cleaning product desired a slower dissolution rate. In that instance, the customer wanted the end user to toss the pod in the toilet, flush it and have that pod travel to the holding tank and dissolve there. 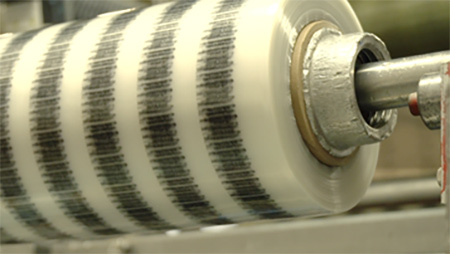 A 4 Mil film thickness achieved the desired dissolution time of approximately 30 seconds. and proper handling instructions be printed on film. It is important that your contract packaging partner understand all regulatory guidelines covering the production, packaging and secondary packaging of water-soluble products for varying uses. Multi-Pack Solutions’ Mount Prospect facility is registered with the EPA and compliant with all applicable regulations in support of our industrial cleaning and packaging capabilities. A product with an efficacy claim, for instance, must follow EPA labeling guidelines to help ensure proper handling. In some cases, a product description and proper handling instructions must be printed on the PVA film to help ensure safe usage. For water-soluble pods in the liquid laundry detergent space, Multi-Pack Solutions adheres to guidelines from The International Association for Soaps, Detergents and Maintenance Products (AISE). Guidelines concerning liquid consumer laundry detergents in soluble packaging for single use include: secondary packaging that is opaque or obscure to impede the visibility of the individual dose product; secondary packaging that carries the “Keep out of reach of children” statement; secondary packaging with a Child Resistant Safety Closure (CRSC); and an aversive agent included in water-soluble film that makes it bitter to taste in the event of accidental exposure. when launching a water-soluble pod product. Products packaged in water-soluble film need to be protected from moisture contamination. Common shelf-ready formats include re-sealable stand-up pouches, tub-style containers and buckets with lids. Choose a contract manufacturing and packaging partner that offers comprehensive secondary packaging options and one that seeks to understand how you envision your product on store shelves. New products introduced in a soluble pouch format can gain a competitive edge and market share, so select a contract packaging partner who understands the players in this space and how you can differentiate your product. A packaging partner who fully outlines the costs of secondary packaging options also is important. From a production standpoint, it is easier to place water-soluble pods into a tub rather than a stand-up pouch. However, the cost of a tub as secondary packaging is much higher than stand-up pouches. Oftentimes, consumer products companies will choose a mixture of secondary packaging. For example, a stand-up pouch may be used for lower counts such as 10-, 12- or 20-count water-soluble pods and a tub for larger counts such as 85- to 110-count. Your contract packager should be willing to produce sample pods so that secondary containers can be properly sized to match various SKUs. You want your brand to stand out in the marketplace, so it’s important to choose a packaging partner that can offer innovative ideas and customized solutions to get your product to market in the most expedient way possible. At Multi-Pack Solutions, our breadth of experience includes water-soluble pod production in the liquid laundry and powder detergent markets for consumer use. Additionally, we offer turnkey solutions in water-soluble pouch production for the agricultural industry, where we’ve gained expertise in the blending and handling of corrosive and hazardous products. Our experience extends into the oil, gas and water treatment industries, where we have developed innovative solutions with a range of water-soluble pouch sizes. Our ongoing investment in multi-chamber pod production equipment gives our customers scalability and the ability for prototype production. Again, finding a contract packaging partner with secondary packaging expertise is critical in the water-soluble space. You will need a packaging partner that understands the practicalities, efficiencies and cost comparisons of secondary packaging such as tubs and stand-up pouches. Finally, the best contract packaging partner will possess trusted partnerships all along the supply chain from equipment manufacturers to PVA film producers. These close supplier relationships translate into consistency quality in materials such as film substrates and efficiencies in production scheduling and timeline management. Strong consumer preference, driven by convenience, consistency, waste reduction and perceived quality suggests that the water-soluble pods industry will continue to grow at a significant rate. Consumers now are accustomed to seeing water-soluble, unit-dose pods on shelves in the laundry and dishwasher detergent aisles. And earlier this year, single-use shaving cream minis began appearing in the personal care aisles in Target stores nationwide. As the desire for water-soluble packaging enters other product categories, it’s important for brands to not only find a contract packaging partner with experience, but also one that is willing to make an investment in innovative ideas and technology. Many will remember that stand-up pouch technology was driven by the co-packaging industry. At the time, brands had large infrastructures and many weren’t positioned to invest in the new flexible packaging technology. The contract packaging industry took the risk to invest in new equipment, making it easier for brands to try an innovative packaging option. At Multi-Pack Solutions, we produce and package more water-soluble pouches than all other contract packagers and manufacturers combined. As the industries that we serve evolve, we continue to invest in equipment that addresses new technology for water-soluble pouches, packets and multi-chamber pods that offer flexibility in sizes and shapes, and fast changeovers. If yours is a virtual company with no manufacturing or R&D capabilities, or you are a buyer new to your marketplace, look for a contract packaging partner who insists on a deep dive into information about the application and specifications of your product to guide you toward the best fit for use. The best partner will be upfront about what they are and are not capable of doing and will make suggestions for the benefit of both parties, the product and the consumer. A contract packaging partner that desires to be involved at ideation will produce the best results for a new product launch. An upstream understanding of the concept outlined by your R&D and marketing departments will allow the most efficient project management and launch steps toward a cost-effective solution to get your product to market in the most expedient way possible.